(Nanowerk News) Researchers at the University of Gothenburg, Sweden, have managed, with the help of an advanced X-ray flash, to photograph the movement of atoms during photosynthesis – an achievement that has been recognised by the journal Science ("Light-Induced Structural Changes in a Photosynthetic Reaction Center Caught by Laue Diffraction"). The European Synchrotron Radiation Facility in Grenoble is home to one of the world’s most advanced particle accelerators, whose pulsing X-ray beams are used by researchers to photograph and study life’s tiniest components: atoms, molecules and proteins. 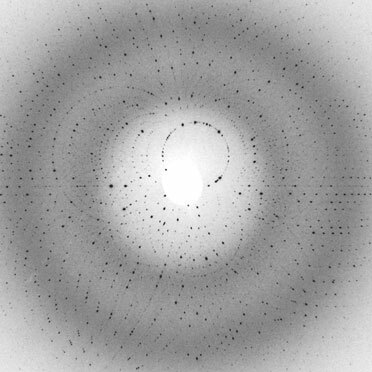 Photograph of the photosynthetic reaction taken with an 80-microsecond X-ray pulse. Using the special X-ray camera, researchers can depict the position of atoms in a molecule and obtain a three-dimensional image of something that is smaller than a billionth of a metre. Researchers at the Department of Chemistry at the University of Gothenburg and at Chalmers University of Technology have now used this advanced technology to photograph the dynamics of life's most fundamental system: photosynthesis. The focus of the study was a protein which is central to the conversion of light to chemical energy during photosynthesis, and which process the Gothenburg researchers have been the first to (successfully photograph) (capture?). The X-ray image shows how the protein temporarily stores the light energy immediately before a chemical bond forms – a movement that takes place on a scale of less than a nanometre.